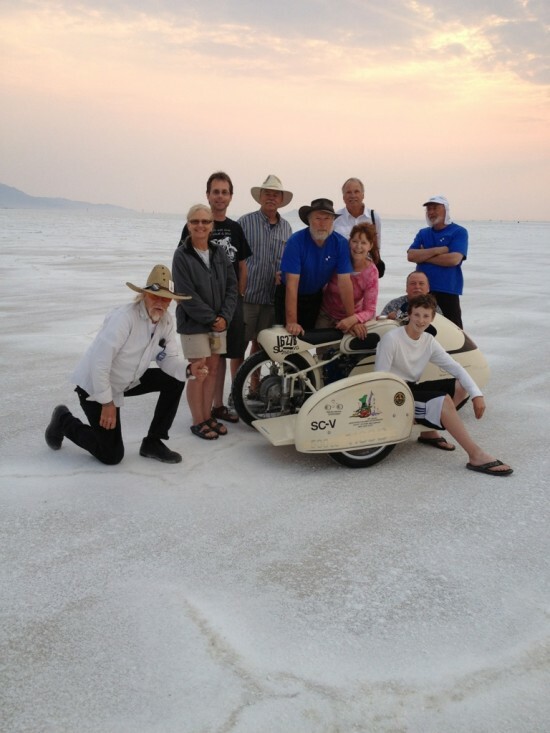 I am back from Bonneville, and if you consider 4 records with two motorcycles a good week, then I was part of a team that had a good week. When you decide to go to Bonneville, the first thing you have to do is find out what records you want to go after. You can order your rule book and go to the garage and see what category your bike fits into. For Brooks Motor Works they were able to use one single cylinder Vintage 250cc bike and go after 3 different records. First you start with a sidecar attached, and a huge Dustbin Fairing. Then you remove the sidecar, change the fairing, and go after the Partially Streamlined record. And last but not least, remove all fairings and go racing naked. 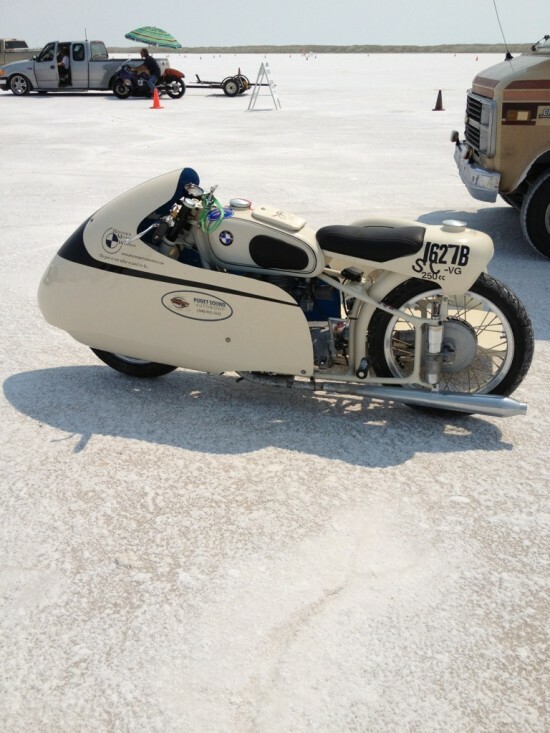 This is how the team was able to get a Sidecar, Partial Streamlined, and Modified records with one bike. The 4th record was also with a sidecar, but two cylinders, and 500cc powered by oxygenated Fuel. With a big Dustbin fairing and a sidecar attached, Kevin was able to make a qualifying run just under 100mph. The surprise was the following morning when he made the back up run at 107mph. Like with the 250cc BMW, the sidecar was removed and attempts were made to take down the Partial Streamlined Fuel record for Vintage 500cc bikes. 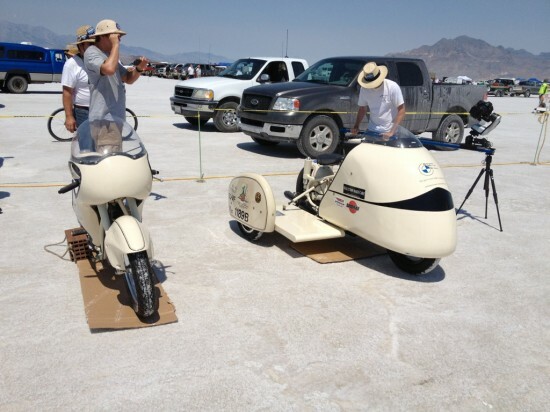 But the heat, humidity, winds and jets would not line up, and the 107mph could not be replicated without the side car. Geez Bri, those tiddler Kriedlers go faster than ONE OH SEVEN and they’re ONLY FIFTY CCs! Just ribbin’ ya! Great job Bro! You’re lucky, I lived in tha God forsaken SLC in ’79. I and the worlds worst girlfriend (Hey look her up in Guiness Book! 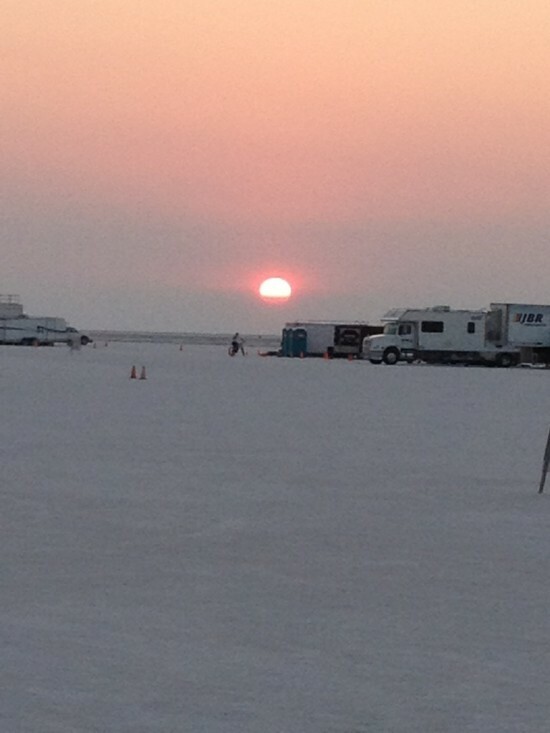 ), drove across the Salt Flats to party in Nevada. It was 120 degrees. My POS ’64 Chevelle Malibu wagon was overheating. That was when I learned (Hey I’m from Seattle!) that above a certain speed ant a certain temperature, if you roll down the windows it’s the equivalent of being blasted by a blow torch… So there I am driving across the Salt Flats, 120+ degrees, windows rolled up and THE HEAT AND FAN TURNED UP FULL BLAST! Ahhh, the memories of my youth!